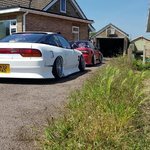 Thread in 'Drift cars for sale' started by lewyS14a, Nov 9, 2018. 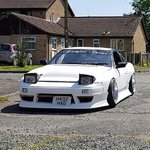 Looking at possibly selling my S13. Ive had it for just over a year now and been a good car and reliable to. The dash says its on 153K but since owning it ive done less than 2K in it. 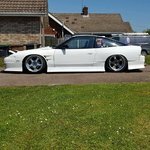 Engine pulls well enough and no nasty gearbox crunching also the shell is in really good shape has had the usual patching on the sills and bit of surface rust but nothing to be to concerned on , its a solid S13 really. The car is sprayed primer white at the moment had intentions of painting it u...p but havn't got round to it. T28 turbo with braided lines running 0.9 bar on HI setting. Modified front subframe with the rack move forward. Rear tyres no brand , front tyres nankang wich are worn but hace a spare set in garage. As you can see it has a good amount of spec but has a few bad points. * the Down pipe is really worn from the car being low will need replacing these arn't much. *Headlights are fixed up as the boost pipes run below them. Other than that this is a solid S13 that drifts and runs well. Swap for e30 v8 ? Would you like to sell the wheels separately? Please contact me with phonenumber in dm or anything. Is the red PS13 for sale too?